Charles Alexander Clouser (born June 28, 1963 in Hanover, New Hampshire) is a former Nine Inch Nails band member whose activities include playing drums and keyboard, engineering, mixing and music programming. Clouser was a member of NIN from 1994-2000 and was part of the live band on the Self Destruct and Fragility tours, as well as collaborating with Trent Reznor in the studio on various projects. One such collaboration being the Natural Born Killers soundtrack on which he aided in recording and producing a new version of "Something I Can Never Have." His work can also be heard on releases such as Further Down the Spiral and Things Falling Apart. 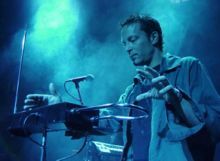 Clouser has shared songwriting credits for the NIN songs "The Way Out Is Through" and "Starfuckers, Inc." He appears in the music videos for "Hurt" (live), "Eraser" (live), "Wish" (live), "The Perfect Drug" and "Into The Void". Clouser has also done remixes for various bands, including: White Zombie, Marilyn Manson, Rammstein, Prong, Killing Joke, Type O Negative, Zilch, Schwein, Collide, 12 Rounds, Foetus, Meat Beat Manifesto and Esthero. He has also worked as a composer, scoring the films Saw (2004), Saw II (2005), Saw III (2006), Saw IV (2007), Saw V (2008), Saw VI (2009), Saw VII (2010), Resident Evil: Extinction (2007), Death Sentence (2007), Dead Silence (2007), Deepwater (2005) and End Of Days (1999), as well as the TV series Las Vegas (2003 - 2007) and Fastlane (2005). He is currently the composer for the series NUMB3RS. He also appeared in the film Moog (2004). This page was last modified on 24 May 2014, at 21:12. This page has been accessed 74,675 times.